When I went to kindergarten (shout out and apologies to my teacher, Mrs. Beasley), I needed crayons and a nap mat. Today’s kindergarteners need graphing calculators and pens. No nap map required. Or welcome. Fifteen years ago, the New York Times published an article about the lack of nap time in today’s kindergarten, and the situation has deteriorated since then. 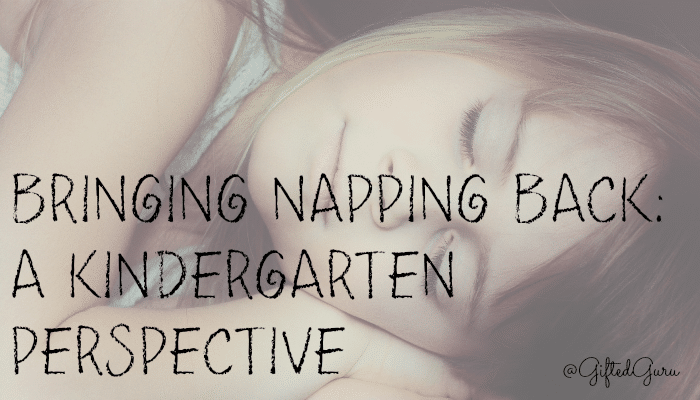 What happened to kindergarten nap time, and how can we get it back? Kindergarten-age children need a lot of sleep. Somewhere between 10 and 13 hours is the recommended amount. They’re not getting it, in case you were wondering. Sleep-deprived children are no laughing matter. They’re cranky. They often behave like the witch in the Wizard of Oz right after the water gets thrown on her (along with accompanying insults hurled). They can’t learn. They won’t eat well. It’s not pretty. Trust me. Is your child hard to wake? Does your child fall asleep spontaneously during the day? Does your child sleep in on weekends? Read his awesome book The Promise of Sleep to learn more about the amazing benefits of sleep for all of us. Just because your child has trouble falling asleep does not mean your child isn’t tired. In fact, the reverse is often true. Over-tired children frequently find it difficult to go to sleep. Trouble getting your little one to buy on the whole “sleep is crucial” thing? The Sleep for Kids website created by the National Sleep Foundation is just for them! We can’t learn if we don’t sleep, and it is backwards to say that we can’t give kids a rest time in kindergarten because they have too much to learn. If they don’t sleep, you might as well take all those worksheets and…well, I think you know what I’d say about worksheets in kindergarten. I’m a teacher. I’m a school administrator. I get it, and I say the people who are creating the learning objectives for kindergarten have lost track of what we know about brain development in young children. Young brains are sponges, yes, but we wet those sponges with play, not worksheets. Naps increase retention. This has been demonstrated in studies with adults and children. 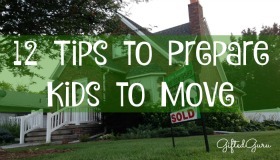 Let those kiddos rest, and they’ll spend less time in time out. One study I think was particularly well done appears to show that staying awake too long makes it harder to control your negative emotions (think “tangry” – you’re tired and angry). For a five-year-old, the school day is a long period of time, especially when you take into account how early some children get up. When you hear that school age children no longer need naps, understand that to the traditional understanding, five-year-olds are preschool age children. School age is typically six. Just like GT kids can get misdiagnosed with other co-existing conditions, a lack of sleep can lead to misdiagnosis as ADHD because it can lead to defiance and hyperactivity. Who doesn’t know what that sleepy punchiness feels like? Not that long ago, I saw a school bus go by with literally a dozen kids asleep, their heads propped awkwardly against the rattling windows, and I literally began to cry. Since when is exhausted children our educational imperative? So if you are in a position of power in a kindergarten, fight for naps. If you’re a parent, make the argument. Anyone who says that there is too much learning to be done to allow a rest time is ignoring the facts to the detriment of children and their brains. Here’s something that should not be news to anyone: play is the work of children, and force-feeding schoolishness in kindergarteners is counterproductive. Some kids won’t nap, sure. They can listen quietly to music, take a break from the sensory overload of school, look at books or read, breathe, the possibilities are wide and restful. I also wrote an article about sleep for the Mensa Bulletin, and you can read suggestions for getting young ones to sleep in that. Unless you’re in kindergarten. In that case, grab your graphing calculator and get working. Your sentence that really got me was “Since when is exhausted children our educational imperative?” I too have seen WAY too many exhausted Kinder babies, as a Kindergarten Teacher. One of which (who also fell asleep on the bus), was “misplaced” and didn’t make it off the bus to day care, because the driver didn’t hear or see him!!! (A.K.A. Was asleep due to exhaustion.) He was left on that bus, turned off with no AC, for over an hour. Since when is this what our Kinder babies should feel like at the end of the day?! My question is, as an Kindergarten Teacher and advocate of naps coming back, how do I begin the process of fighting for it? Where do I begin in my district? Or even in our state? What do you suggest? – Contact your state representation and/or senator and encourage them to consider making it the law. Some states have laws about it, and so can our state (we live in the same state, it happens). However at age 5/6 I think that it is a huge waste of time to make children physically lay on a mat to try and nap. I say try because many students do not actually fall asleep but are forced to lay still quietly. I personally feel if you have a child who needs to nap set up a space that accommodates that child. I do not think it is fair to the child who does not need to sleep to have to lay on the ground. I send my child to school to be educated socially, emotionally and creatively not to sleep. While I appreciate your opinion, the neuroscience research just doesn’t support it. Play and rest are crucial to a child’s social, emotional and cognitive development. So while lying down may not be what you send your child to school for, it would benefit him/her nonetheless. Tired children don’t perform as well in any domain. Lying still for awhile is not a punishment, but needed rest. There is no way that you can have a class where some children are lying down and others aren’t, as I think you recognize. Agreed. I teach full day kindergarten. The expectation is not to nap but rest, read, listen to music. In the fall there’s always one or two who fall asleep. Rarely do the kids complain about rest time. I use it to pull kids who need 5- 10 mins 1-1 support, stage 1 RTI, do short assessments (all of which are fine 1-1 and there’s now tins in kdg). Our afternoon is busy with math and specials like ar, science music etc. The kids need the down time! I have to agree with you here. Research shows that by five, most children have given up nap afternoon time naturally. That isn’t to say they don’t need quiet time and rest. I’m a teacher who has worked in kindergarten, and I agree it’s torture for many of them to be compelled to lay quietly on a mat for an hour and a half. Most kindergarten programs do not run a full day and frankly my observations have been (especially in the case of preschool where children had to lay down for two hours) that this forced nap time was more beneficial to the staff than to the students! My own children got plenty of sleep at night at this age, and rest periods during the day when they needed it. If they do fall asleep that’s great. However it shouldn’t be forced. 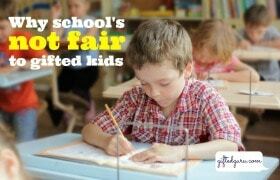 I would disagree that most kinder programs aren’t full day. I’m only talking about full-day programs here – not half-day. I see you mentioned that GT kids are often misdiagnosed with other co-existing conditions. Can you expand on that further? I am a mom of a GT kid about to begin schooling and I just am trying to understand how to best prepare. Sure! The misdiagnosis of the gifted is a well-known phenomenon in the GT community. For great information, I’d start here: http://sengifted.org/archives/articles/misdiagnosis-and-dual-diagnosis-of-gifted-children! I am so glad I find your article! when I fetch him last week, he was tried and fall to sleep very early before 7:30, but I didn’t have got chance to play or seat with him before bedtime, he was very tired and easy to get him cry and screaming! I am really miserable here, also my 2nd boy is due this September, so it will be difficult to keep quiet in the house at night, so how my 3 years old can get full sufficient sleep at night and keep up all day long….??? A child that young needs naps. I would find a different daycare situation if they are not facilitating that. It’s that simple (and complicated). Hello Lisa! Thank you for your so much needed article and simple but yet efficient explanations. Yes, it is very important for children to nap, and we as adults well know it. How would you advise preschool teachers to tackle this with children directly? Although most children sleep at preschool, not all of them fall asleep at the same time, keeping the rest of the class awake and thus causing stress for the other children, teacher and themselves also. What methods would you recommend in this situation? As you may well appreciate, they cannot be simply made to fall asleep or made to stay still. As a mother of a preeschooler I am worried that nap time may be worry time for some children that fall asleep later then others or that simply cannot fall asleep every day and need extra atention to facilitate relaxing time. Sleep is a habit, and consistency is the key. Most preschool teachers are adept at facilitating naptime because I have yet to see anyone argue that preschoolers don’t need a naptime. I actually would disagree that preschoolers cannot learn to either fall asleep or lie quietly. This can be facilitated with dim lighting, weighted blankets, music, or guided meditation for kids. Most importantly, parents must make sure that the are being consistent about naps on weekends and holidays. Oh, I love this comment! You are so correct – it’s a rights issue! Our school mandates 30 minutes of nap/rest time for Kindergarten. What would you suggest about kids who sleep longer? do you think it is okay to let them sleep on? A lot of my incoming Kindergarteners were in my preK class last year where we give the kids about 1hr 15 minutes of nap/ rest. I know a number who don’t sleep till after 15 minutes and would sleep through the entire 45 minutes remaining. Moving to Kindergarten it may not be different for them . I’d go ahead and let them sleep. What they might miss is less detrimental than risking waking a child in deep sleep and getting a meltdown. There will need to be a limit, of course, as you wouldn’t want them sleeping for hours and interfering with nightly sleep. If you have a child who does sleep for very long periods, a discussion about nighttime sleep habits with parents is probably in order. I found your article after doing some research on the subject. This is the first year that our children’s school has done away with what they call “rest time”. They did away with naps a while ago, but now they even took away the 20 or so minutes that they did have to recoup a bit from such a long day. Our daughter comes home the last few days of the week and is so completely exhausted that she is falling asleep before I even get dinner on the table at 5:30. Not to mention how cranky she is and this is even with her getting a minimum of 10 hours of sleep a night. We are through the 1st quarter in the school year and I was hoping she would be able to adjust, but I’m seeing no signs of it. I contacted the school board who then passed me to the superintendent and after 11 days I finally got a response and his response was that the other kids are “handling it” and that in our state it is not required for the kids to attend Kindergarten, so we could take her out of school if we wanted to. I was appalled by this response to say the least. Since then we have left a message for our State Commissioner of Education and are waiting for a response and I have also sent out a mass e-mail to all the kindergarten parents at the school and many parents feel the same. I am going to wait a response from the Commissioner of Education and see what our options are and get a petition going, so we can submit that. Any further suggestions to get our kids “rest time” back would be appreciated!! It’s so crazy because they need time to rest, especially because they’re getting so much stimulation. What you’re doing is correct – gathering strength in numbers of other parents. You may wish to contact your state senators and congressperson as well, as they can actually change the law to make it mandatory to have a rest time. I would build in a rest/nap time when she gets home from school of 20 – 30 minutes or so. I really appreciate your response!!! We are plugging along with this and if we cannot get anywhere locally I will definitely go the route of contacting our senators and congressperson. I did not even think about that avenue, but will definitely use that if need be. I have actually tried giving her a short nap when she gets home, because well, she just falls asleep anyway, but in the past when I allowed her that nap, she didn’t get to sleep at bedtime and was up later and then it makes for a rough day following that. We have put her to bed a little earlier and let her eat breakfast at school rather than waking up a little earlier to eat before getting on the bus, but even with these changes she is still exhausted by the end of the week. Thank you again so much for the information! When I was in full day kindergarten in 1990, there were no naps, and no one seemed to miss it. Today’s kindergarten students are older than in the past too, in the 5-6 age range rather than 4-5. Most children stop napping by 4 or so. Five and particularly six year olds should not need naps if they are getting enough sleep at night. Perhaps a child who needs a nap should wait another year before starting kindergarten. I disagree. The research just doesn’t bear that out. Anecdotal evidence, while interesting, is not conclusive. I don’t agree that children who need sleep should be held back. That’s especially true of the gifted. I also don’t agree that kids are older in kinder now. Do you have stats on that? Thank you for your article. I understand your point of resting. My son is four and a half now and since he turned three he is not napping. He goes to pre-school where he has to rest quietly for two hours, but he has never napped. Sometimes he makes problems because he cannot be quiet on his mat. It has been more than a year now and I don’t remember when he actually napped in pre-school. Is it ok to make him rest quietly for two hours? That seems like a lot of time, especially since he never falls asleep. Shouldn’t he at least be given an opportunity to read once 45 minutes to an hour have passed? So, this doesn’t actually sound like preschool to me. It sounds like daycare. Preschool would be just 2-3 hours a day, in which case two hours of naptime is obviously unreasonable. It sounds like he is actually in daycare, not preschool, which is different. So here is my thought about daycare napping: two hours is probably too long for a child that age, if they are not going to sleep. That said, I’m curious about what they’re doing to allow for sleeping. If you read the studies they found that a hand on the child’s back was helpful, along with other techniques. That said, assume the child simply isn’t going to sleep. There are other restful activities like listening to soothing stories in a darkened room while curled up in a soft blanket, breathing exercises, and even child yoga. Two hours lying on a mat isn’t useful, and that’s not what I’m advocating. What I would suggest here is that you put your child in an actual preschool if possible, and then he can have a naptime at home that is appropriate for him. If you need him in daycare all day, then I would suggest either negotiating with the one he’s in or finding a different one that will accommodate a shorter period of time. Thank you! You are right, it is effectively daycare, but it is called preschool. They do provide darkened room, soothing music, maybe even hand on the back (at least they used to when he was smaller). Still, my son simply never falls asleep and he has to be on his mat for two hours without moving much. How much time would be beneficial for him to rest quietly at this age?